A 38-year-old Caucasian woman was admitted to our hospital with complaints of a swollen right leg. Her medical history comprised ductolobular breast cancer, which was treated 14 years earlier by lumpectomy, axillary lymph node dissection, and adjuvant radiotherapy, chemotherapy, and hormonal therapy. Last follow-up visit a year before presentation did not show any sign of relapse. On admission the swollen leg was accompanied by shortness of breath. Physical examination showed a swollen, red and painful leg. The liver area was painful on palpation. Subsequent investigation with duplex scanning demonstrated a deep venous thrombosis until the common femoral vein with the possibility of further extension proximally. Low-molecular-weight heparin and vitamin K antagonists were initiated. Because of shortness of breath and abnormal liver tests a computed tomography (CT) scan of the lungs and liver was performed, followed by positron emission tomography (PET) (figure 1). 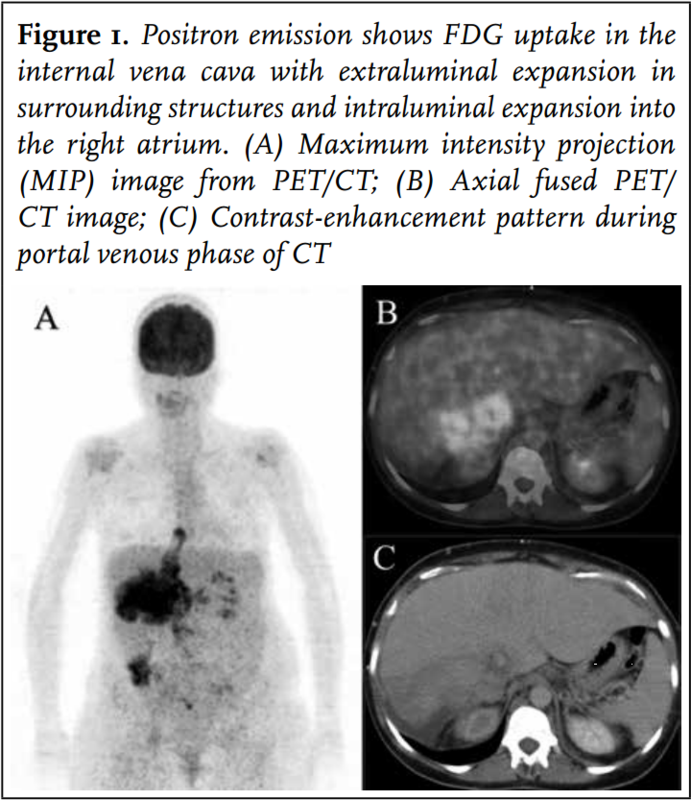 The CT scan revealed a 12 cm mass in the liver, which was associated with a tumour thrombus in the IVC extending into the right atrium, equilateral hydronephrosis, and intrapulmonary multiple small noduli. Positron emission tomography (figure 1) showed pathological 18F-fluorodeoxyglucose (FDG) uptake in the right liver with expansion into surrounding structures as well as in the entire IVC thrombus mass. This finding corroborated the idea of encasement of the IVC by tumour with the presence of malignant cells in the caval thrombus extending into the right atrium. The noduli in the lung did not show FDG captation, these were probably too small to be PET-positive; nevertheless, these noduli were considered to be metastases. Transthoracic echocardiography revealed a non-mobile mass in the right atrium suggestive of extension of the tumour mass into the right atrium without haemodynamic consequences (figure 2). Initially a recurrence of the earlier diagnosed breast cancer was suspected, but invasion of the IVC and right atrium did not fit with this diagnosis. Following the PET-CT an ultrasound-guided biopsy of the liver was obtained showing the histological and immunohistochemical characteristics of a leiomyosarcoma (figure 3). Leiomyosarcoma is a relatively rare and aggressive form of cancer which can arise from virtually any site, including the gastrointestinal tract, nasal sinus, heart, tunica media of blood vessels, uterus, retroperitoneum, skin, and musculoskeletal system. Of these, leiomyosarcoma of the inferior vena cava (IVC) is barely reported in the literature. In most cases concerning primary involvement of blood vessels, the bulk of the tumour is located extraluminal. In our case a curative resection was not feasible because of extensive invasion of the surrounding tissue, with high suspicion of pulmonary metastasis. The patient was treated with chemotherapy comprising ifosfamide with the cytoprotective drug sodium-2-mercaptoethane sulfonate. Unfortunately, the patient developed encephalopathy after the first cycle of ifosfamide. Methylene blue was started and ifosfamide discontinued with resolution of the neurological state after three days. Despite the neurological improvement, her condition further deteriorated until no further therapeutic options were possible and after a month of hospitalisation the patient left the hospital in a palliative setting. ESMO European Sarcoma Network Working Group Soft tissue and visceral sarcomas: ESMO Clinical Practice Guidelines for diagnosis, treatment and follow-up. Ann Oncol. 2012;23:vii92-9. Mingoli A, Cavallaro A, Sapienza P, Di Marzo L, Feldhaus RJ, Cavallari N. International registry of inferior vena cava leiomyosarcoma: analysis of a world series on 218 patients. Anticancer Res. 1996;16:3201-5.